A year or so ago I read Andrés Neuman’s epic novel Traveller of the Century and its ideas coupled with an abundance of grace, charm, wit and intelligence just blew me away. And then came Talking to Ourselves, a shorter but no less compelling novel; it’s a meditation on the proximity of death and grief, a kind of literary collage comprising three distinct voices each adding different tones to the narrative. So, imagine my excitement when I received a copy of The Things We Don’t Do, Andrés’ collection of short stories. Early versions of a few of these stories, in different translations and often under another title, have appeared in literary magazines (such as Granta), but all the stories in The Things We Don’t Do are newly translated by Nick Caistor and Lorenza Garcia. I offered my arm to my mother, who had so often given me hers when the world was very big and my legs very short. Is it possible to shrink overnight? Can someone’s body turn into a sponge which, impregnated with fears, gains in density while losing volume? My mother seemed smaller, thinner, and yet more weighed down than before, as though prone on the floor. Her porous hand closed around mine. I imagined a little boy in a bathtub, naked, expectant, clutching a sponge. And I wanted to say something to my mother, and I didn’t know how to speak. Other stories touch on the subject of our identity. In one of the most playful stories in the book, Juan, José, we meet a man undergoing counselling following the death of his parents; unable to move on, he believes and behaves as if his parents are still alive. As this tale progresses, the boundaries between the identities of the two characters begin to blur, and it becomes increasingly difficult to tell which of the two is the patient and which is the counsellor. Interestingly, another therapist – a different one this time – crops up again in a darkly humorous story, Outside No Birds Were Singing, played out as a frantic telephone conversation between a counsellor and her seemingly suicidal patient. Another clutch of stories explore the relationship between guilt and innocence. A man tells of his presence at the scene of John Lennon’s murder at the Dakota; we see how feelings of guilt stealthily corrode the relationship between two friends after they are mugged in the street one night. And in After Elena (one of the highlights of this collection for me), Neuman explores the theme of forgiveness; following the death of his wife, a man decides to forgive each of his enemies, and we see the differences in the source of their animosity and reactions to this gesture. The Things We Don’t Do is an excellent collection of stories, one that illustrate Neuman’s considerable range and skill as a writer. These stories vary in tone, mood, style and length; some are playful, others more sombre in tone; some include metafictional elements while others are more conventional (but never ordinary) in terms of style. One of the things I love about these stories is their ability to surprise – one never quite knows what might be coming next. On the whole, I would say these short stories are closer in style to Talking to Ourselves than the richness and generosity of Traveller of the Century. That said, I recognise the writer of Traveller in some of the stories, especially those in the final section: Piotr Czerny’s Last Poem, The End of Reading and The Poem-Translating Machine. The latter story focuses on another of Neuman’s favourite themes, that of translation; not simply the need to translate language, but the idea that we are constantly translating and interpreting feelings and gestures in our communications with others. The collection ends with a series of Neuman’s reflections on the short-form narrative; not a set of rules as such, but a ‘playful way of approaching the essay,’ and they make interesting reading. I like that we don’t do the things we don’t do. I like our plans on waking, when morning slinks onto our bed like a cat of light, plans we never accomplish because we get up late from imagining them so much. This is my first review for Richard’s celebration of Argentinian (and Uruguayan) lit which starts today. 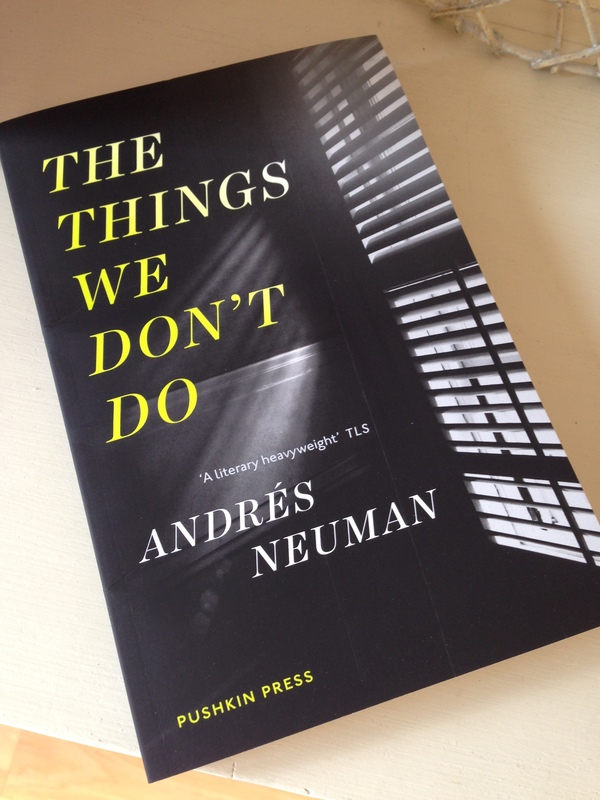 The Things We Don’t Do is published in the UK by Pushkin Press. Source: review copy kindly provided by the publisher. This entry was posted in Book Reviews, Neuman Andrés and tagged #TranslationThurs, Andres Neuman, Argentina, Book Review, Literature in Translation, Lorenza Garcia, Nick Caistor, Pushkin Press, Short Stories, Spain on September 1, 2014 by JacquiWine.